38, of Houlton, Maine; assigned to the 3rd Squadron, 3rd Armored Cavalry Regiment, III Corps, Fort Hood, Texas; died Dec. 14, 2007 in Mosul, Iraq, of wounds sustained when enemy forces attacked his unit using small-arms fire. On August 16, 2015, Justin and Jessica Cloukey of Lincoln, Maine met with Jon’s brother and sister-in-law, Win and Janice Lowery. Together they discussed Jon and the tribute stone they selected to represent their fallen family member. Jon grew up in Houlton and wanted to be a soldier from an early age. He played “Army” with his childhood friends. He joined the Maine National Guard at age 17 and attended UMPI for a couple of years after high school graduation. In 1990, during Desert Shield, he enlisted in the Army full time. He deployed to Kuwait and Iraq for Operation Desert Storm and eventually became a tank commander. For most of his career he was based at Fort Sill in Oklahoma. 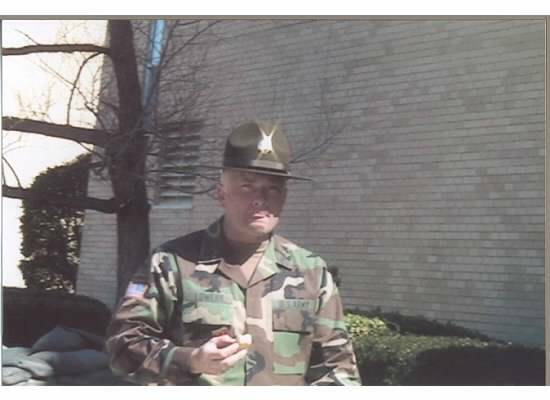 He had been an Intelligence Analyst, Howitzer Chief, Drill Sergeant, Gunnery Sergeant, and Senior Drill Sergeant. He had deployments to Kosovo and Guantanamo Bay. In 2003, Jon deployed to Khanaqin, Iraq with the 1-17 Field Artillery out of Ft. Sill. Their mission was to train Iraqi Civil Defense Forces. The troops were welcomed by the local Kurdish population. Jon was touched by the poverty he saw and shared the candy from his “care packages” with the local children. In 2007, a year away from retirement, Jon volunteered for one last deployment. 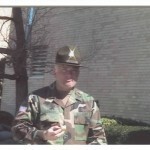 As a drill sergeant, he felt guilty about sending his young recruits to war while staying behind in safety. With the 3/3rd ACR out of Fort Hood, he was sent to Mosul. Win got to see him one last time when his plane refueled at BIA. He was killed a few weeks later. 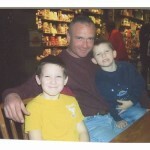 Jon had two sons, Sean and Dawson, who were 11 and 8 at the time of his death. He loved them more than anything else in life. The absences imposed by Army life were emotionally painful for him. They have grown into fine young men and he would be tremendously proud of them. We are participating in the Summit Project for them as well as for their father. My heart is saddened by his loss. My thanks to him for trying to make a horrible situation better for people that he didn’t even know. He was from Maine and he could have been anyone”s Son, Husband and Father and Brother. My name is Jeffrey Paradis and I had the Honor of carrying Sgt. First class Lowery’s stone to the Summit of Cadillac Mt. I was not sure what to expect of this trip/hike or how it would effect me. In the beginning it starts out as just a hike, another physical exercise we put ourselves through to see what were capable of, it wasn’t very long into this particular hike before we started to get rain and hailed on. My first reaction was oh great this is going to be a miserable day, Fortunately the adverse weather didn’t last long! By midway threw this hike I started to realize, The family of this fallen Hero (Lowery) as to get up and deal with the horrible reality that they can never see their Son/ Father ever again!! We, as a society must remember the Sacrifice the Soldiers have made for us!! I Thank Major David Cote for starting this Organization and hope I can be a part of it in the years to come. 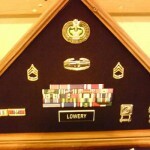 A very Heart felt Thank you to Jonathan Lowery for his Service to his Country! To Sean and Dawson, the sons of Army Sargent First Class Jonathan Allen Lowery. Hiking with the Courage stone in your fathers memory was a life changing experience. After learning about your father, and the leader he was a few words come to mind. Selflessness, bravery and commitment, qualities I am sure live on thru you and the young men you are becoming. While hiking with the Courage stone my thoughts were on the both of you. To me you both are the antithesis of courageous. Your journey thru life keeps your fathers spirit alive. I assure you the memory and story of Jonathan Lowery are strong in the energy of The Summit Project family. I hope you will one day have an opportunity to experience The Summit Project bond and share your story of your father. Your fathers story of courage and sacrifice will continue to impact the lives of many who hike with his memory . My name is Lydia Jacobs and I had the honor of carrying Jonathan Lowery to the summit of Owl a few weeks ago. I had a heavy pack and even heavier heart carrying Jonathan’s stone and story to the summit on this last hike. It was my first Summit Project and I wasn’t truly sure what it would be like, what I was supposed to say, or how I would feel. Being brought into it last minute, I lost sleep for the few days leading up to the hike. I worried that I wouldn’t do my heroes justice at the summit, or that I might not be strong enough or fit enough to take on the challenge. At the trailhead I was anxious and nervous for the hike ahead. I felt the weight of the stones in my pack and put one foot in front of the other. I figured, if nothing else, I could at least do that. A mile into the hike, the rain began, soaking through layers of clothes and through my backpack. But there were no complaints. There was this feeling of stubbornness among us. Like we weren’t going to stop for anything. No matter how tired we were or how soaked we were or what we were feeling or thinking, it didn’t matter as long as we got to that summit. When it was time to pull our stones out and tell the stories of the fallen, I was overwhelmed by the emotions that took over in that moment. I felt incredible sadness for the losses of these people that I just wish I had the chance to meet. I had rehearsed and rehearsed Jonathan’s story, thinking over and over about what I wanted to say and how I wanted to say it. I even wrote it down on a piece of paper and stuck it in my bag. However, in that moment, I forgot about the paper, I forgot about what I rehearsed and I realized that there is no script that would do a hero like Jonathan justice. My heart ached and the tears were pretty much uncontrollable but I had this huge sense of pride in him. He’s the selfless, kindhearted type of person that I hope someday I can be and I don’t want anyone to forget that. I carried a hero and a friend back down the mountain that day. 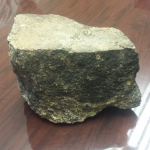 “I was fortunate to carry this hero’s stone up a mountain with my friends at camp. This stone was taken from a place not too far from where my camp is! This soldier sounded like an awesome guy and it is tragic that he passed. We wish the best to all of you. I had the honor of having Jonathan’s hero stone travel with me for a week, along with the stone of Marine Cpl Mark Goyet. Since I returned the stones to The Summit Project, I have been struggling for the words that would give justice to their sacrifice and the impact I felt by having them with me. The connection that comes from carrying the stone is something that cannot be described in words. Something happens in my heart , a better understanding of life, of sacrifice, duty, family and of love every time I carry a stone. While I had the care of these stones, I brought them to work with me each day and was able to talk about Mark and Jonathan and share their heroic stories with many people. While I have not yet carried Jonathan’s stone on a mountain trip, I carry his story in my heart forever. I look forward to sharing that story for the rest of my life to ensure that he is never forgotten. I had the honor of caring for Jonathan’s stone for a week, along with that of Marine CPL. Mark Goyet. My name is Doug Zogby and I had the honor, privilege and pleasure of carrying Army Sargent First Class Jonathan Allen Lowery stone to the top of Laura’s Tower in Stockbridge, MA. How we ended up in this location is an interesting story. Our initial plan was to hike a location in the NH White Mountains on our way to my granddaughters christening in Central NY . Our plan was to be up early that morning and hike and then head to NY. We received a frantic message from my daughter saying that she left Maine for NY without the baby’s bag, which not only had her clothes, but her Christening Gown as well. So we had to drive close to 3 hours back to Maine, get the bag and head to NY. This necessitated that we take the more traditional interstate route to NY and as such seemed to scuttle our plane to hike. For me this was my first hike honoring a Maine Fallen Hero and while this was not Debra’s first HMFH hike, she was just as disappointed as I was…but the Christening Gown was needed to so our mission was clear. So as we hit the road I was trying to think of a place to stop which would be scenic and serene so we could get out hike in. The Berkshire Mtns. called to us, specifically Stockbridge, and thanks to our smart-phone we found a trail. We completed our hike and I was so honored to carry Sgt. Lowery’s stone to the top of the fire Tower. Never was I so gratified to turn a 6 hour car ride into a 14 hour one, the stone had to be hiked. What I did pales in comparison to what he did for our freedom. In some way I hope that Sgt. Lowery was looking down upon us knowing that his ultimate sacrifice allowed us to celebrate the new life of a baby girl who will live in freedom because of his service. Hello TSP. My name is Chris Whytock and I had the honor and privilege of carrying the stone of SFC Jonathan Lowery for TSP at ANP 2016. TSP does an amazing thing for not only the memories of Maines fallen heroes, but their families as well. Jon’s story seems to be focused around his family and the strength his family gained from him. The Hike up Bubble and to the top of Cadillac gave me more than enough time to think about Jon’s amazing story and I could feel him with me as I struggled up a few sections of trail. Jon seemed to be a man who didn’t back down from a challenge. In fact his Army brethren often called Jon a tough but fair man. One of his subordinates described a time when they were deploying overseas and as the bus pulled away, a wife was running behind it and trying to catch up but to no avail. SFC Lowery stopped the bus and told the soldier he had on minute to comfort her and say goodbye. Tough but fair. As the stone ceremony began I knew it was going to be an emotional one. 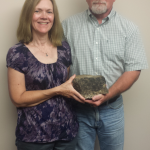 Jon’s older brother and sister in law were joining TSP for the first time and when I handed over his stone to them I had a hard time talking with them. I couldn’t help but feel sorrow for the loss of Jon. But in talking with his family after the ceremony they spoke of Jon’s love for his family, his calling to serve,and love for the country he literally gave his all for. They told me his two sons were growing up and he would be very proud of them. They said he always found joy and piece within his family and that was the connection I drew to Jon. Family means the world to me for so many reasons and to know and understand that makes me, and Jon, a better man. I hope this experience was worth if for Win and Janice. 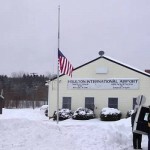 I hope it shows that Maine Heros are Never Forgotten and that Jons story will live on through others because of TSP. I was honored to be able to hike up Streaked Mountain for the Summit Project. I’ve never hiked up a mountain before but hiking up this mountain for the Summit Project was a great experience. While carrying the rock up the mountain, I realized how lucky I was for what I have. Hiking up the mountain, I had Jonathan on my mind, and I kept on thinking what he went through. I was complaining about going up this mountain but I realized other people probably have it worse. It means a lot to me that Jonathan gave his life so that his loved ones and his country could stay safe. I wish I would’ve met Jonathan before he passed away. I would’ve loved talking to him and ask him questions about what went on behind the scenes. He seemed like a really loving and caring guy and I’m really sorry for your loss. I’ll always remember Jonathan as Hero for our country. Thank you for letting me have the honored of carrying Jonathan’s rock! I was very honored to carry Jonathans stone to the top of Little Bigelow. My name is Ian Simpson and I’m a sophomore at Nokomis Regional High, I am in Jrotc and we as a class participated in the summit project. I chose Jonathan’s rock because when I read his story that he went overseas with his men and didn’t stay in the US where there was safety, I thought he was a strong and brave man when he made that decision. When I was hiking the mountain I kept thinking of how good I have it with both of my parents and I couldn’t imagine what I’d do without them. So Jon definitely had an impact on my life and made me appreciate what I have everyday. I hope Jon’s legacy lives on forever and I will remember Jon for the rest of my life. It was an absolute honor to carry the stone and memory of Jonathan. I’m a very visual person, and looking at pictures of Jonathan showed me exactly the person that Jonathan was. An extremely dedicated, disciplined, and selfless man. Additionally, the photos with his family showed the softer compassionate side of Jonathan. Being complete in both aspects of his life clearly enabled him to be the wonderful man that he was. Carrying Jonathan’s stone up Katahdin was very fitting after talking with this brother Win. He let me know that Jonathan was always looking for a challenge and loved to push himself and those around him. I’m sure Jonathan was always the one adding a little extra weight in his ruck, or helping those around him through either motivation or shouldering some of their weight. Following our hike, Jonathan’s story got a bit more personal for me. One of my friends from flight school, Ryan Owen saw my post on facebook about Jonathan. He is currently medically discharged and hiking the Appalachian Trail with his family to “walk off the wars”. Ryan served with Jonathan and they had deployed to Kosovo as well as Iraq together in the same platoon when Ryan was an artilleryman. Unfortunately, Ryan lost touch with Jonathan and was unaware that Jonathan had passed. He let me know what an amazing Soldier Jonathan was, how they bonded over being New Englanders and how hurt he was to learn of Jonathan’s passing. Please email me (Michael.keighley@gmail.com) if you’d like for me to connect you with Ryan. Jonathan, thank you for your service and sacrifice. The fact that you volunteered for one final deployment prior to retiring speaks volumes about you. From my experience the majority of others that are within reach of retirement tend to do the opposite. It takes an incredible sense of integrity and selflessness to do what you did. You undoubtedly inspired and left an impact on so many Soldiers still serving today. Rest easy Jonathan, you will continue to impact so many through your actions. I would like to personally thank you for sharing Jonathan and his life with us and others who take part in this amazing program. To Jonathan’s brother Win, it was truly an honor to carry your brother’s stone to the top of Owl Mountain on Memorial Day weekend. When I read about your brother, a few things struck me very personally. First, that he was born the same year as my brother, who I also lost, many years ago. Second, that he left behind two sons. I have of two of my own children who are about same age as Jon’s sons were when he passed. My heart breaks for them. It makes Jon’s sacrifice all the more painful. I also came across the words that his ex wife wrote about him. I was moved not only by the words she wrote, but that they were obviously written with love. He must have been an exceptional man. In all that I read, his dedication to his men and his family were very apparent. As well as the personal sacrifices he made in order to serve his county. Grief often feels like a heavy weight upon your back. It is perhaps appropriate that Jon’s stone was of particularly weighty proportions. The extra weight in my pack that day wasn’t a burden though, on the contrary, it make me feel stronger and more capable of tackling the days challenges. It is the stories that keep our lost loved ones alive. Perhaps we will meet one day at one of the TSP events, and you can tell me about your brother. And to his sons, who would be men by now, there are no words for me to adequately express how sorry I am for your loss. Please know that we at TSP consider ourselves a family, and you are part of that family as well. If you ever decide to come see what we do first hand, you’ll be welcomed with open arms. A link to this site was just forwarded to me. I would like to thank everyone that has carried Jon’s stone. It is very touching that you all take time out of your day to remember the fallen each year. I know that Jon would have been very appreciative of all that you have done. He wasn’t one to draw attention to himself. He was always more interested in helping others. He was very respectful and thankful for anything that was done for him. He loved the military and serving his country. He wouldn’t have wanted to do anything else. I would like to say thank you on behalf of Sean and Dawson for everything that everyone does to remember Jon and his sacrifice. I had the honor and privilege of carrying SFC Lowery’s stone on my first TSP hike on the Kebo Team hiking in Acadia National Park. They say the stone picks the hiker and I believe this to be true. Although this hike is about his memory, as read about Jon’s life I couldn’t help but think about mine and all I have because of the sacrifices he made, even before that last deployment to Iraq. I like Jon am a parent of two boys and as a reservist I have to leave for two week periods every year. This is difficult for me because sometimes I am 3,000 unable to make hockey games, help with homework, or just be there for them to have them tell me about their day. For Jon, and many other active duty, this was just the scenario 2 weeks out of the year. He selflessly made this a career, sacrificing all these things full time and everyday so the rest of the nation doesn’t have too. We get to come home each night and see our families and be there for all the small things we often take for-granted. Not only did Jon make this sacrifice but the military family does too, giving up a son, brother, husband or father in the name of this country. I am sure it wasn’t easy for Jon to be aware from his children and family. I can almost guarantee that. It is up to us each day to seize the day and the opportunities men and women like Jon provide us, not only for ourselves but in memory of their name. Let us not take these sacrifices for-granted. So the next I have had a long day at work and want to skip my son’s hockey practice, I will remember that somewhere there is a service member missing their child’s practice, game or graduation so I never have too. In addition, Jon’s service in particular continues on within the TSP. 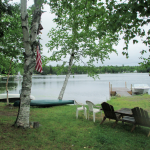 Through Jon’s memory I was able to many amazing people while enjoying the beautiful landscape that is our home state of Maine. I had the honor and privilege of carrying SFC Lowery’s stone on my first TSP hike. They say the stone picks the hiker and I believe this to be true. Although this hike is about his memory, as read about Jon’s life I couldn’t help but think about mine and all I have because of the sacrifices he made, even before that last deployment to Iraq. I like Jon am a parent of two boys and as a reservist I have to leave for two week periods every year. This is difficult for me because sometimes I am 3,000 unable to make hockey games, help with homework, or just be there for them to have them tell me about their day. For Jon, and many other active duty, this was just the scenario 2 weeks out of the year. He selflessly made this a career, sacrificing all these things full time and everyday so the rest of the nation doesn’t have too. We get to come home each night and see our families and be there for all the small things we often take for-granted. 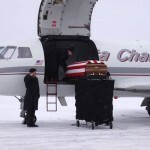 Not only did Jon make this sacrifice but the military family does too, giving up a son, brother, husband or father in the name of this country. I am sure it wasn’t easy for Jon to be aware from his children and family. I can almost guarantee that. It is up to us each day to seize the day and the opportunities men and women like Jon provide us, not only for ourselves but in memory of their name. Let us not take these sacrifices for-granted. So the next I have had a long day at work and want to skip my son’s hockey practice, I will remember that somewhere there is a service member missing their child’s practice, game or graduation so I never have too. My name is Jodie Dyer and I work for a non-profit in Bangor. We currently have the honor of hosting the display case with all the stones. I just wanted to say a very Happy Valentine’s Day to the family of SGT Lowery. As I read his biography I couldn’t help but feel so grateful for his service to our country and beyond. I’m deeply saddened that he lost his life, but please know he will never ever be forgotten and his legacy will live on through his boys. We will never forget! !